The belief is that Ganpati visits us every year. Ganpati is happily bid adieu by immersing the idol in the sacred river. The immersion procession soon became a matter of privilege for the mandals. A dispute arose among the mandals regarding which of the mandals would lead the immersion procession. Tilak resolved the dispute by granting the privilege to Shri Kasba Ganpati as it was not only the local deity but also the most ancient deity in Pune. 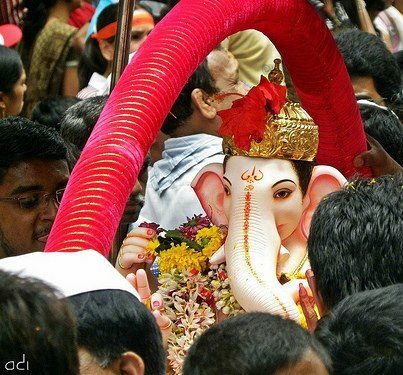 To this day, Shri Kasba Ganpati Mandal leads the immersion procession to the banks of river Mula with great fanfare. 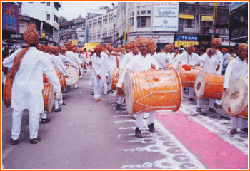 The immersion procession of Shri Kasba Ganpati is unique in many ways. Shri Kasba Ganpati is the first Ganpati to be immersed in Pune city. The Mayor along with the Commissioner of Pune offer prayers to the idol of Lord Ganpati after which the immersion process of Lord Ganesh starts in the city and continues for the whole day. It is customary to fill the air with colored powder called ‘gulal’. The mandal dissuades the use of gulal as it is hazardous to health. 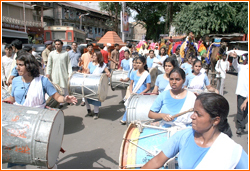 The immersion procession of Shri Kasba Ganpati also includes different groups who show their talent and skills. All the other mandals follow Shri Kasba Ganpati. People from far and wide along with the volunteers of Kasba Ganpati take an active part in the immersion process. During the immersion process, Lord Ganesh is placed in a Palkhi. The palkhi is made up of silver and the devotees carry it on their shoulders. During the entire procession, the Palkhi halts at each square to allow devotees to offer prayers and to have a glimpse of Lord Ganesh. The mandals perform traditional dances, mythological plays, and play music, to appease the Lord. The immersion procession concludes at the banks of river Mula that is approximately 10 km from Shri Kasba Ganpati Mandir. At the concluding point of the procession, the Mayor of Pune, along with the Commissioner of Pune welcome Shri Kasba Ganpati and address the devotees present. The Mandal volunteers along with the trustees celebrate this auspicious moment by dancing amidst chants of ‘Ganpati Bappa Morya. Phudchya Varshi Laukar Ya’ (requesting the Lord to arrive early the next year) and proceed towards the riverbank to complete the immersion rituals.